I have received some questions recently about various periodicals related to Rhode Island genealogy. Which ones are worth seeking out? Let’s review them all. 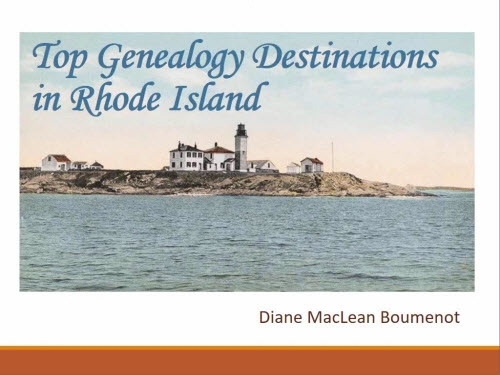 Published by the Rhode Island Genealogical Society since 1975, four issues per year cover family genealogies, articles and advice about local resources, valuable transcription projects, news, book reviews, and queries. The unique stories of Rhode Island’s families are regularly featured. 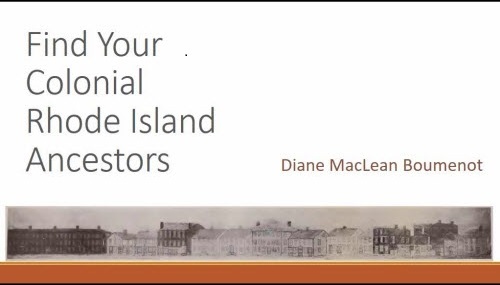 A top notch journal with footnotes that provide enormous insight into Rhode Island’s record sets and their application, RI Roots should always be consulted for any pre-1900 Rhode Island family or for examples of research practices in each town or era. It is also a good place to consider submitting your own articles on Rhode Island topics. Annually, an additional “Gleanings” volume provides transcribed town council records from one of Rhode Island’s towns, properly indexed; such work is not available anywhere else. A membership to the Rhode Island Genealogical Society includes a subscription to current issues. For access to older volumes, check availability through the Rhode Island Genealogical Society website. Rhode Island Roots is published four times per year, plus a bonus issue with “Gleanings” of local town records. Published by the Rhode Island Historical Society, Rhode Island History has been published since 1942, in four issues per year. Initially covering both Rhode Island’s history and its genealogy, a decision was eventually made to discontinue genealogy articles, which was one motivation for the formation of the separate Rhode Island Genealogical Society in 1975. 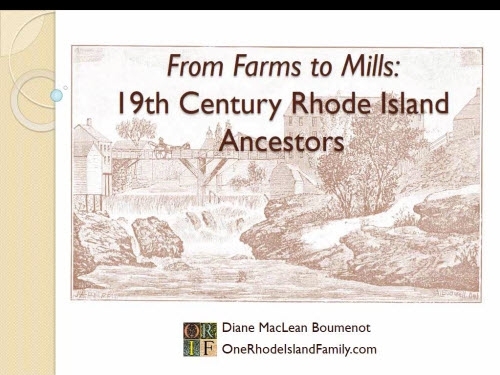 So look for genealogical articles in the early years, and fascinating stories about Rhode Island’s history, artifacts, customs, historic sites, and folkways in the full range of issues. Available through membership in the Rhode Island Historical Society, back issues are available online at the Rhode Island Historical Society website. Rhode Island History features interesting articles on Rhode Island’s unique history. Full name: The Narragansett historical register : a magazine devoted to the antiquities, genealogy and historical matter illustrating the history of the state of Rhode Island and Providence Plantations. Founded and published by James Newell Arnold, better known for his published indices of Rhode Island’s early vital records (Vital Record of Rhode Island), the Narragansett Historical Register ran for 9 volumes, 1882-1891. Originally “devoted to the antiquities, genealogy and historical matters illustrating the history of the Narragansett Country, or Southern Rhode Island,” the issues gradually came to represent work concerning all areas of Rhode Island. One feature in most issues was the abstracted vital record sets which eventually became the basis for the larger and more complete volumes of vital record indices; in fact Mr. Arnold ceased publication of this journal as that new project grew in size and complexity. Historical sites, articles by local genealogists, queries, transcribed journals and church records, historical events and documents, snippets of local history, and the more than occasional poem fill out the issues, interspersed with editorial reflections and countless quirky stories found nowhere else. Sometimes Mr. Arnold reported on family genealogies in production which may or may not have eventually produced a published book; perhaps one could follow up searching for surviving manuscript notes from those authors. Illustrations and maps in the online copies will no longer be under copyright and might make nice graphics for our own family genealogies today. All volumes are online and may be downloaded. Each volume is indexed at the front (last name only). No human can resist these adorable volumes of the Narragansett Historical Register reprinted by Heritage Press. Alden G. Beaman, like James N. Arnold 100 years before him, launched a series of vital records (Rhode Island Vital Records, New Series) and a genealogy periodical. Rhode Island Genealogical Register is the genealogy periodical, which ran for 20 volumes, 1978-1996, produced by Mr Beaman and other interested family members. No longer in print, and still under copyright, the volumes must be perused in a library, or purchased used. Much of the content consisted of abstracts of records which, today, are available digitally and are searchable elsewhere. For instance, in a long series called “They Left Rhode Island,” census records of other states were culled for residents with Rhode Island origins and lists of abstracted records were produced; a digital search would handle this now, although possibly one could try a quick check in case such records had been badly transcribed in online indexing. Probably the most valuable contents are the probate abstracts for numerous Rhode Island towns. Volume 16 consists of an index of all the probate abstracts contained in volumes 1 – 15; it is often called the “Will Index.” One looks for a name in the Will Index, follows the citation to the probate abstract in another volume, and from there gathers the citation for the original town probate location including book and page numbers and uses that information to track down the original records. Although very far from complete, and the abstracts may contain assumptions or errors, this can be a quick and easy start to a probate search. But a more thorough search for probate would be to utilize the complete town probate books (on microfilm) located on Ancestry.com, or of course in the town offices. Cemetery abstracts appear from time to time as well as some land abstracts, church records, freeman records, book reviews and articles. It is hard to use a single volume of this work; the entire set is usually needed as the indexing often covers multiple volumes. In general, I do not recommend a great deal of trouble be taken to locate or purchase this work. Pursue the records captured on microfilm now appearing (but not necessarily indexed) on FamilySearch.org and Ancestry.com. Some 1985 issues of the Rhode Island Genealogical Register. Many volumes are bound into blue covers, a familiar site in repositories. Full name: The Providence Society Blue Book including Suburbs in Rhode Island together with Fall River and the Attleboros, Mass. Few copies of this social register, apparently published (according to Worldcat.org) from 1905-1936, appear online and it is unclear how many issues are held at local repositories in Rhode Island; more info will appear here in the future if I find them. The 1905 issue is available. Individuals are listed with their address, spouses, grown children, and club memberships; wives’ maiden names are listed. Interesting features include social and heritage Club information with membership lists, ads for services such as dressmaking, millinery, jewelry, and furs, as well as private schools and lessons, medical offices, and the following mental health service. An ad from the Providence Society Blue Book, 1905, page 150. Dr. Bates’ Electropathic Sanitarium. My ancestors must have been grateful they couldn’t afford this. Also The Narragansett Blue Book (1900), The Social Register, Newport and the Newport Social Index (and see 1909) provide guides to the summer residents in these resorts, which were very fashionable at the turn of the 20th century. The Boston Transcript was a Boston, Massachusetts newspaper that regularly carried a page of genealogical questions and answers. That feature ran a couple of times per week for several decades in the late 1800’s/early 1900’s. It is gradually becoming easier to locate these papers online. In its day, it was a bit like the online query forums we see today; people sent in a question, and others wrote in to respond publicly, and if private responses were made, those are now lost to time. Some of the leading genealogists of the day would offer advice and guidance on difficult family questions; often, a specific answer pulled from records would be given. These columns are indexed in the American Genealogical Biographical Index (AGBI) produced by the Godfrey Memorial Library, Middletown, Connecticut. Today, one sees these index entries turn up in Ancestry.com search results; using them, one should seek out the newspaper columns; this link offers information about current online access. The Genealogical section of the Boston Transcript usually takes up one page, or less. This feature ran in the weekly newspaper The Newport Mercury from January, 1899 through sometime in 1922. It printed reader queries, responses submitted, and also transcripts of items of historical interest, often pulled from old manuscripts. It was similar to the Boston Transcript service, above. For the years it ran, most issues can be found on the subscription website Newspapers.com; see this link. I was able to search using my basic paid subscription; access does not require the upgraded subscription type. One tip: when looking at search results, remember that most Notes & Queries columns appear on page 8 (the last page of the paper). An entry on page 8 could easily be from the genealogy column; an entry found on page 1 – 7 is likely to refer to persons and events contemporary with the time the newspaper issue was published. Not a periodical, but a series of books or pamphlets published in the late 1800’s by Sidney S. Rider, a prolific Providence bookseller, author, and passionate collector of Rhode Island ephemera. Rhode Island Historical Tracts. Series 1, 1 – 20, Series 2, 1 – 5 cover mostly quirky historical topics, but there is an index to series 1, found in volume 20. All volumes are online. Mr. Rider did publish a periodical, called Book Notes: For the Week, Historical, Literary, and Critical, conducted by Sidney S. Rider. Covering the literary and historical topics of the day, as they were discussed in Rhode Island, the best a genealogist could hope for in that work is perhaps reference to some obscure writings or manuscripts about a certain village or event in Rhode Island. Personally I have never found much info useful to my genealogy, but from an era featuring several opinionated/eccentric self-styled historians, the impassioned writings of Sidney Rider and James Arnold can be fun to read. Some compiled volumes of Book Notes have been digitized and are available online. A chart accompanying an Austin article in Rhode Island Historical Magazine, volume 4, p. 226. Prior to the start of Rhode Island History in 1942 (see above), at various points in its nearly 200-year history the Rhode Island Historical Society offered several periodicals. The following publications contain materials central to the understanding of the Rhode Island history that impacted our ancestors. Frequently, long papers or transcribed manuscripts appeared in these volumes. Similarly, a journal published by another organization, The Publications of the Narragansett Club, featured long transcriptions of key documents in Rhode Island’s history. These should not be thought of as places for searching our ancestor’s names; instead they offer glimpses into the world of the colonial Rhode Islanders, and the issues that shaped their lives, for instance, first settlements, King Philip’s War, the Seven Mile Line, historical and military relics, or the writings of Roger Williams. Run by the predecessors of the Providence Chamber of Commerce, Providence Magazine not only featured business news and ads, but focused on a positive image of old Providence. Issues appear online from 1916-1922 and probably more can be found. The pre-1923 online issues not only picture local businesses that your ancestors might have worked in, but occasionally feature drawings that you could use in your own family history works. The articles are reflective of the business viewpoint regarding life in Providence – for instance, a 1919 article about the downtown stores closing on Saturday nights at 6:00 p.m., instead of remaining open. That would have marked a change in our ancestors’ lives. Some veterans’ issues and memorials are also discussed, as well as Providence’s public institutions and libraries. Look for other business periodicals for Rhode Island in the late 1800’s/early 1900’s, particularly, some jewelry industry publications. Providence Magazine, April, 1916, p. 258. This is an ad for Victor Cleansing Co., owned by the family of my friend Midge Frazel. It’s a good example of the glimpses of larger local businesses that you can get in this magazine. Report of Genealogical Records Committee of Rhode Island N.S.D.A.R. Local members of Daughters of the American Revolution have diligently transcribed various Rhode Island records such as cemeteries and records held at town halls. This series of reports is housed at the Rhode Island Historical Society, among other places, but some issues (1933-1954) can be accessed in an affiliate library through FamilySearch.org, which filmed the series long ago. While in many cases the records captured are now available elsewhere (for instance, it’s possible that the cemetery records were included in the work of the Rhode Island Historical Cemetery Commission), there are likely some unusual records in this set that are not available elsewhere. Apparently the records are held in some format at the NEHGS library in Boston as well as, I’m sure, the DAR. A series of pamphlets and booklets published by this organization offer some helpful content for pre-Revolutionary War military affairs impacting Rhode Island. A full list of publications is available from the organization, as well as a briefer list offering web links. Very likely, most or all paper copies could be found at the Rhode Island Historical Society, as well as some additional manuscript materials. One of the many booklets published by the Society of Colonial Wars of the State of Rhode Island. There is Rhode Island content to be found in other genealogical journals around the country, either in the national journals or from the places Rhode Islanders traipsed off to – the rest of New England and also New York, Ohio, and Michigan, to name a few. The Mayflower Descendant also includes content on Rhode Island families. Many genealogists like to subscribe to the National Genealogical Society Quarterly (NGSQ), or The American Genealogist (TAG) both for the content and for the lessons contained in each article about research, analysis, and documentation. Many of those with Rhode Island ancestors also belong to the New England Historic Genealogical Society in Boston. The New England Historic Genealogical Society offers online access with indexing to older volumes of a growing range of journals. Some are available publicly (although you must establish a login); more are available to NEHGS members. Use their Search feature at AmericanAncestors.org and specify the category “Journals and Periodicals.” This helpful video reviews the use of journals and the online search process. There are about 30 journals currently available there. The Plymouth Colony Pages website by Dale Cook offers compiled Table of Contents guides for about a dozen journals. Containing titles and authors for articles over a period of many years, these guides could allow for quick hunting of an article on a family name or a specific location, assuming these were mentioned in the title. The articles themselves would have to be pursued elsewhere. If you have additional suggestions and links, leave them as a comment. Happy reading! Get the popcorn; it’s movie time as we learn more about drilling down at the FamilySearch.org website. Rather than write about it, I’m going to show you in three very brief videos. More and more of those Family History Library microfilms are now available online. It is really a game changer since, no matter what your location, you can see page images from the early records held in various town halls and state offices. But we need to change our mindset from using the Record Search feature to search names, and learn more about drilling down BY LOCATION to access those unindexed record sets newly appearing online. Not all are online yet, and not all online records are accessible from your home, so there’s a lot to figure out as we access these record sets. But it’s important , as genealogists, that we access the most original source of records possible, and in many cases, these microfilmed images are the next best thing to being in the town hall ourselves. If the records found show a camera icon with a key, that means they can only be viewed at a Family History Library or, perhaps, an Affiliate library. Thanks, as usual, to our friends at FamilySearch.org who are making a tremendous effort to help us access these records, for free. If relevant to you, check out the late 19th century-early 20th century Providence vital records which contain the “returns” of marriages and deaths. “Return of a Death” forms, from the Providence City Archives were filmed years ago. The films are not indexed fully. You have to browse from image to image, jumping forward in the record set as you guess where your date might turn up (the order by date is not very dependable, though, additional cards can be thrown in at the end of the month). It’s very rewarding when you find what you want AND it contains the FIRST version of the details, before all the re-transcriptions happened, creating errors and omitting certain pieces of data. These have been a gold mine for me. See sample, below. The “Return of a death” record for Hannah Andrews Lamphere, my ggg-grandmother, in Providence, Rhode Island.